4 DAYS. 400 BRANDS. COUNTLESS WAYS TO CELEBRATE DESIGN. Now in its 17th year, the Architectural Digest Design Show draws approximately 40,000 design aficionados to interact with incredible design displays from more than 400 brands. New York is ready for us and the “Berço" will rock the City that doesn’t sleep. Visit us at Piers 92 & 94, 55th Street at 12th Avenue, booth 1000. 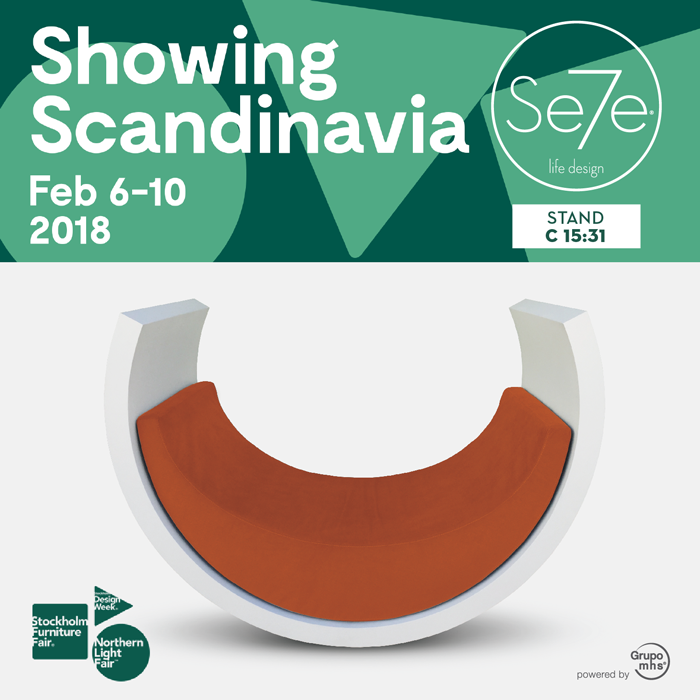 From 6 to 10 of February we are going to be present at the Stockholm Furniture & Light Fair 2018, the world’s largest meeting place for Scandinavian design with the latest innovations within interior design and lighting for both homes and public spaces. You can find us in the Associative Design space, our internationalization partner where the best of Portuguese design is. Visit us at stand C15:31 and have a rocking experience with the “Berço”! The “Berço" is about to rock the U.S.A!! Se7e life design will be at the High Point Market, the largest furnishings industry trade show in the world, bringing more than 75,000 people to North Carolina, every six months. Serious retail home furnishings buyers, interior designers, architects, and others in the home furnishings industry can be found in High Point twice a year because if you can’t find it in High Point… it probably doesn’t exist. It will be a new market for us, but we are certain that the Berço will rock it!! It has been a great experience!! Se7e life design was present in two of the most symbolic design events in London and Dubai!! And theres is a third (North Carolina) coming soon. We do rock hard. In London 100% Design, it was time do present 2 new products!! The "Nuvem", a foam wall and lightning option that will light up inspiring places and the “Varios”, a multi-functional bench - With this one, it’s easy to find so many applications. Today a chair, tomorrow a table, perhaps a bench - Fits all the needs. The “Berço” was at The Hotel Show Dubai for the first time, allowing us to present ourselves to new markets. Serving the industry for the last 18 years, The Hotel Show Dubai is the region’s largest, most prestigious hospitality event in Middle East, Africa and Asia. It is a one-of-a-kind event, which brings together industry heads, a showcase of the latest trends, developments and evolutions in hospitality as well as suppliers from across the globe. Se7e Life Design was been at Design Shanghai and was rocking the cool Chinese people. Asia’s Leading International Design Event. Where eastern and western designs meet with synergetic philosophies that work together across five areas: Contemporary, Classic & Luxury, Collectable, Kitchen & Bathroom and Workplace. 100% Design London is the largest and longest-running design trade event for industry professionals in the UK. Se7e life desig will be present with lots of new things happening. If you are around, visit us at Emerging Brands and have a rocking experience! The "Berço" wins the prize Silver in Interior Furniture of the 1st European Product Design Awards. European Product Design Award honors the best in the product design globally with the goal of advancing the appreciation of design worldwide. The winners were announced at the European Parliament in Brussels, Belgium the last April 12, 2017. Check the newsletter here. Check the ePDA website and the other winners here. We are going to be present at the Design Shangai, Asia’s Leading International Design Event. Where eastern and western designs meet with synergetic philosophies that work together across five areas: Contemporary, Classic & Luxury, Collectable, Kitchen & Bathroom and Workplace. You can find us in the AIMMP space – the best of Portuguese design. Visit us at the Contemporary hall / stand E2-60 and have a rocking experience with the “Berço”! The world’s largest meeting place for Scandinavian design was very enthusiastic with the “Berço”. Cold weather in Sweden at this time of year is a classic; the fun rocking experience within interior design was an innovation. From 7 to 11 of February we are going to be present at the Stockholm Furniture & Light Fair 2017, the world’s largest meeting place for Scandinavian design with the latest innovations within interior design and lighting for both homes and public spaces. You can find us in the Associative Design space, our internationalization partner where the best of Portuguese design is. Visit C10:38 us and have a rocking experience with the “Berço”! Se7e scored again at 100% Design, the UK’s largest trade event for architects and designers. Visitors from all around the world enjoyed rocking the “Berço” and it was considered the FUN place to be at the event. The success “Berço” achieved was so remarkable that the organization chose it to be the reward of a prize draw that was held between the visitors at the event. And because the swinging motion is a natural movement the ecological footprint of the "Berço" will always be a sustainable one. Alongside with our partners from That Place we made a presence in Maison & Objet, the top global trade show in home decor, design and lifestyle accessories and more. Se7e chose London to first present the "Berço" to the Design Society. The "Berço" was treated like royalty and received compliments from both professional and public visitors. Artistic partnerships were made. Business meetings took place. New friends were made. We happily represented Portuguese Design in the Emerging Brands category at ease like a grown-up brand. Thank you, London. You rock.